End-to-end automation of an integrated liquid chromatography-mass spectrometry (LC-MS) workflow for target screening applications is readily achievable and yields substantial advantages. An automated, robust platform that combines high quality target mass interpretation with fast analysis times can boost the efficiency and productivity of drug discovery laboratories. Thermo Fisher Scientific has designed and implemented an automated LC-MS workflow optimized for accurate target mass interpretation. Under the control of the Thermo Scientific™ Dionex™ Chromeleon™ Chromatography Data System (CDS) software, this customized, fully automated workflow is in operation at Bayer Pharma AG, with a reported success of finding the target mass in about 90% of more than 9,000 reaction controls studied to date. Herein we describe a robust and efficient LC-MS workflow for high-throughput target mass analysis. It combines ultra-high performance liquid chromatography (UHPLC) and high resolution MS capable of accurate mass analysis and rapid compound identification and quantification. State-of-the-art Chromeleon CDS software synchronizes and controls the system components, ensuring a seamless workflow from the set-up and initiation of a screening run through data analysis and results reporting. 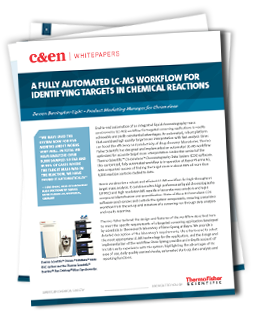 End-to-end automation of the LC-MS workflow enables rapid, high quality target mass analysis to boost productivity. Chromeleon CDS software synchronizes and controls all components of the UHPLC and high resolution MS workflow. Example of an automated workflow developed for a real-world target screening application at Bayer Pharma. In-depth account of Bayer’s early experiences and results of screening.